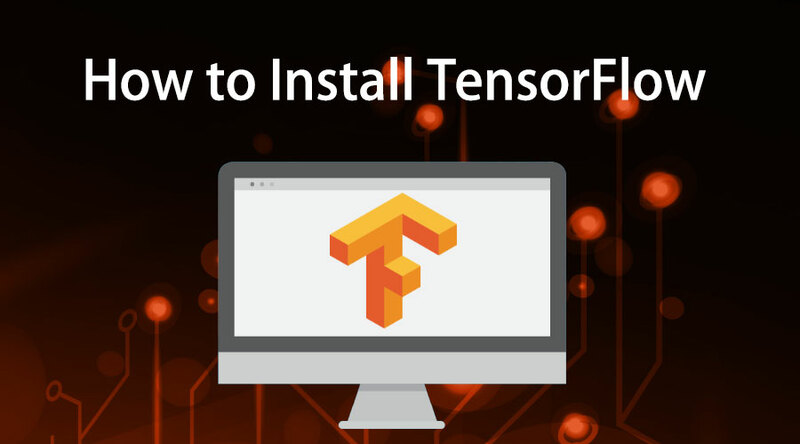 In this install tensorflow article, we would first get a general overview of TensorFlow and its use in the Data Science ecosystem, and then we would install TensorFlow for Windows. TensorFlow is a software application, popular for implementing Machine Learning algorithms particularly neural networks. It was developed by Google and released as an open-source platform in 2015. It’s called TensorFlow because it takes input as multi-dimensional arrays which are also known as Tensors. We could construct a flowchart of operations that we want to perform on that input, i.e. data goes in at one end and then flows through this system of operations and comes out the other end as output. TensorFlow is popular because of its extreme versatility. It could be run on different platforms like desktop, or a cloud or in a mobile device. All of this could be done using a single API. It could be trained on multiple machines, and then we could run it on a different machine. TensorFlow is very fast because it’s written in C++, but it can be accessed and controlled by other languages, mainly Python. Another great feature of TensorFlow is TensorBoard which enables us to monitor graphically and visually the work of a TensorFlow. Someone who is interested in Machine Learning especially neural network should learn TensorFlow. A Data Flow graph has two basic units: A Node representing a mathematical operation, and an edge which serves a multi-dimensional array known as tensors. So, this high-level abstraction shows how the data flows between operations. Once the graph is created, an inner loop is written to drive computation. Inputs are fed into nodes through variables or placeholders. In TensorFlow, computations are run only after the session is created. Why TensorFlow is preferred in Deep Learning? TensorFlow has broad built-in support for Deep Learning and neural networks, so it’s easy to assemble net, assign parameters, and run the training process. There are trainable mathematical functions that are useful for neural networks. Any gradient based machine learning algorithm will benefit from TensorFlow’s auto-differentiation and suite of first-rate optimizers. TensorFlow is compatible with various machine learning due to its extensive collection of flexible tools. 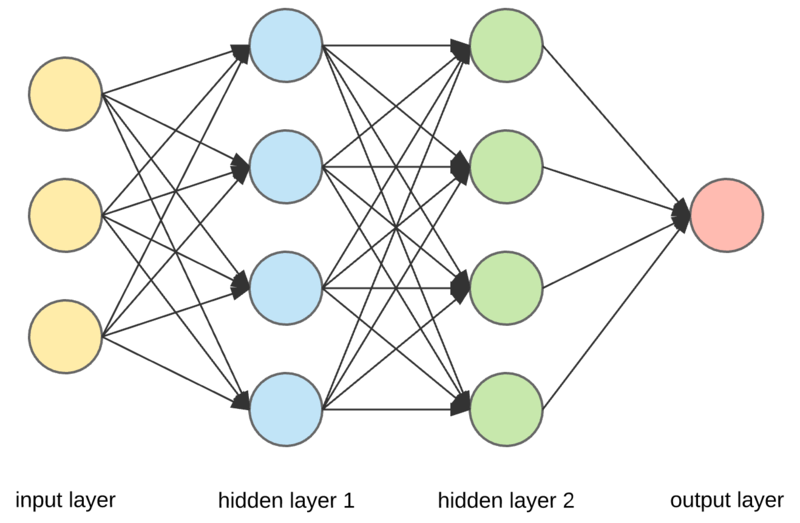 A Deep Neural Network handles more complex behavior where each input is processed by activation functions like Hyperbolic Tangent, Logistic function, etc. The choice of activation function affects the network’s behavior, and TensorFlow gives control over the network’s structure. TensorFlow could also be used in building simple Linear and Non-Linear models. Setting up TensorFlow using Anaconda Prompt. 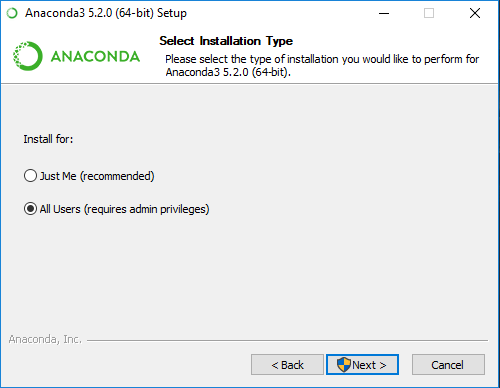 Anaconda is a bundle of some popular python packages and has a package manager called conda (similar to pip). Some of the popular anaconda packages are – numpy, scipy, Jupiter, nltk, scikit-learn, etc. 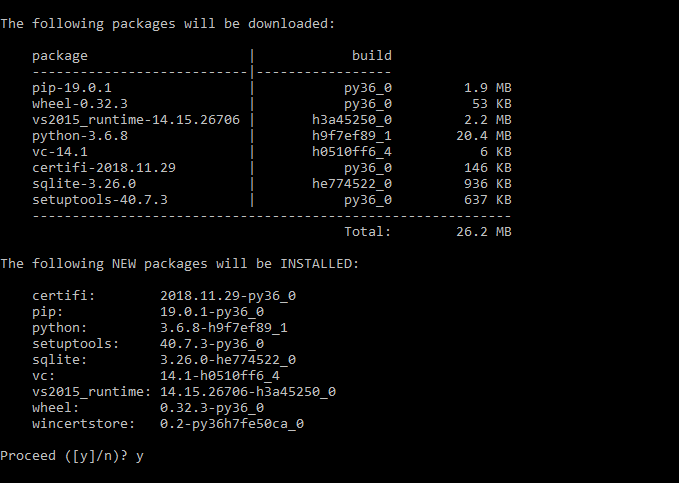 If you have Python installed in your windows, then to install all these packages, you need to run pip, whereas if you install anaconda, you get all these packages at one shot. 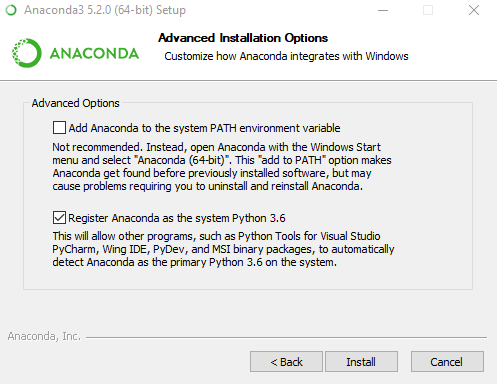 Below steps illustrates how to install Anaconda on windows. 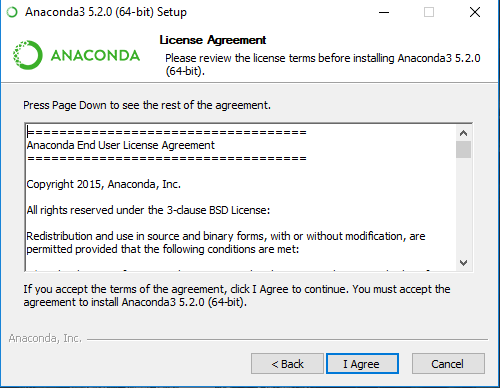 Python 3.7 doesn’t support TensorFlow, so we will use Anaconda for Python 3.6. Once the installer has been download, double-click on it and selects Next. Click I Agree in the next window. Select All Users, and Click Next. Choose the Install Location as you deem appropriate and click Next. 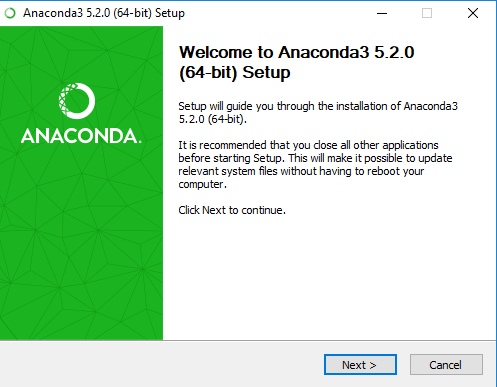 In the next window, Check the ‘Register Anaconda as the system Python 3.6’ box and click Install. Let the installation continue and once finished, click Next to complete it. 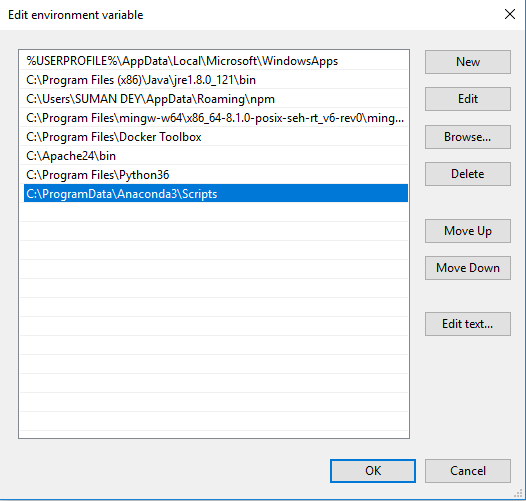 Then go to Environment variables in windows to set the path. 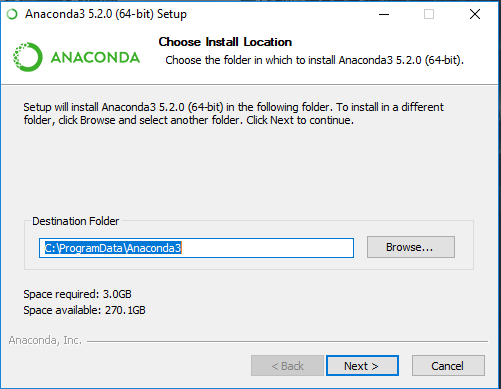 Click on New and add the Scripts folder where you have installed Anaconda and click Ok.
Now, Go to Windows Search Bar and type Anaconda Prompt. 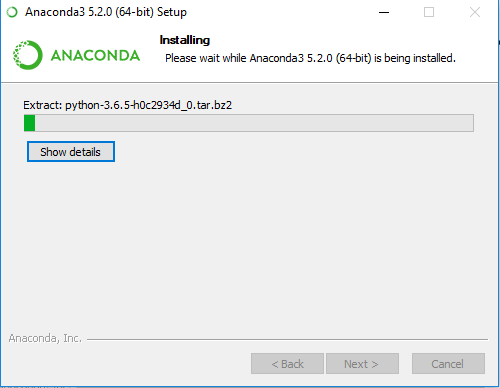 Double click the app and type conda –version to confirm its install. Go to Anaconda Prompt and type conda create -n myenv python=3.6 and hit enter. 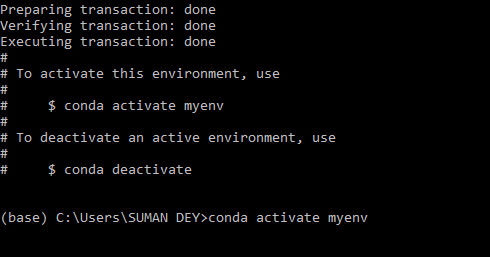 Type conda activate myenv and enter Enter to go inside the environment. Once it is done, Type python and then types import tensorflow. If no error is there, then it is successfully TensorFlow install. Deep Learning has emerged at the heart of nearly every major computational breakthrough in the last few years. It’s already in many of our daily products like Netflix and Amazon’s personalized recommendations, spam filtering, and even our interaction with personal assistants like Apple Siri or Microsoft Cortana. However, it’s not only science applications that are benefitting from this research. 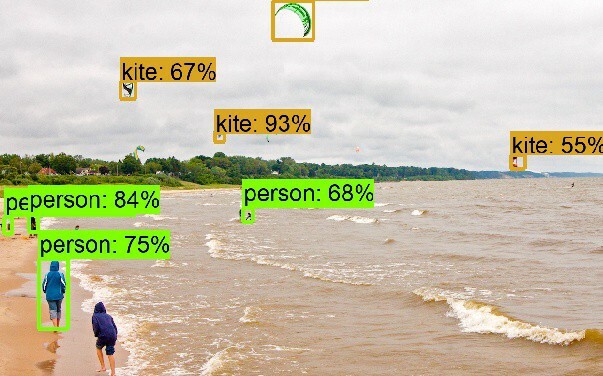 People from other disciplines are also starting to explore how deep learning could be used in cases like Object Detection (as shown in the image). It teaches the computer to recognize an object in a picture and then use this knowledge to drive new behaviors. Keras model could be directly exported to the SavedModel format and used with TensorFlow spring. Binaries are built with XLA support, and Keras models could now be evaluated with tf.data.Dataset. Ignite Dataset added to contrib/ignite that allows working with Apache Ignite.